Alright, here we go, I’m just going to come out and say it- I don’t like Dear Evan Hansen. I find Pasek & Paul’s music a little cheap in its emotional trickery and while that drum-kit-here/belt-note-there/get-your-heart-pumping “This Is Me” theatrics work brilliantly in something like The Greatest Showman where the spectacle is the substance, Dear Evan Hansen is about authenticity and living in your own skin so the Glee-ish musical style and repeat-a-hashtaggable-catchphrase lyrics get irritating quickly with even the tiniest bit of scrutiny. Steven Levenson’s book is similarly angering in its contradictions and simplifications. There’s an astute observation about performative grief to be found here and the complicated emotion touched on in “Requiem” suggests Levenson really had something to say before he got sidetracked by trying to make people feel good when maybe the better musical would have been about being okay with feeling bad. But maybe none of that matters? This production is cookie cutter to the original as all new musicals are so what’s really on trial here is the cast and this cast is top-notch, arguably even improving on the much-beloved OBC. Stephanie La Rochelle’s voice is stronger than her Broadway counterpart’s and Evan Buliung‘s natural depth adds much-needed layers to his thin sketch of a dad character. 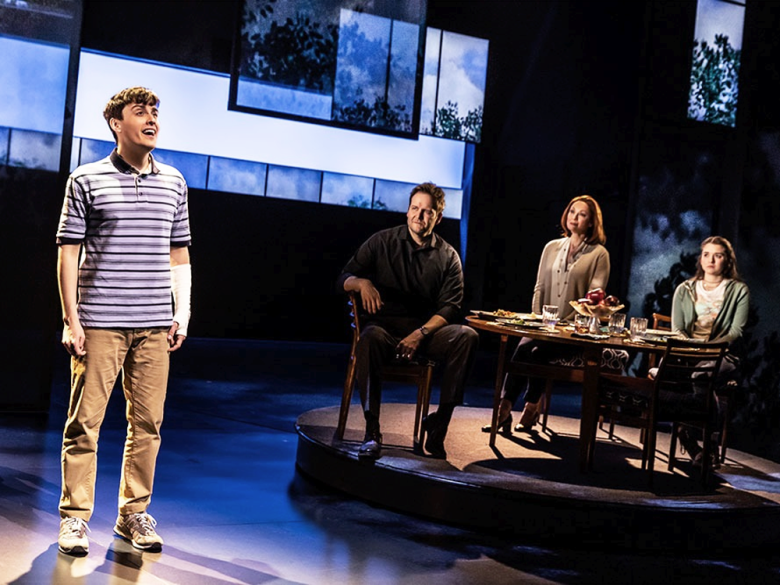 All the supporting roles in Dear Evan Hansen are broad approximations of people with big feelings but the Toronto cast is diving in as though there is more there than there is. In the title role, Robert Markus is filling the shoes of Tony Winner Ben Platt, one of those leading men whom people bought plane tickets to New York just to see. If given the choice between Ben Platt and Robert Markus I would choose Robert Markus any day of the week and twice on Sunday (that’s a movie quote, he doesn’t perform twice on Sundays. It’s also important to note that he’s not doing matinees so pick an evening performance or you’ll get an alternate). Markus is older than you’d normally think a stage teenager should be but the tradeoff is that he has the acting restraint and vocal control of a more mature performer (he also reads very young; if you didn’t know you probably wouldn’t know). In his hands, Evan’s ticks and quirks are lived-in rather than put-on and his incredible range allows him to pick and choose between falsetto and belt with more thought to the emotional moment than the physical reality of hitting the note. Long story short, this has to be a personal call. I’d hate to tell you to skip the chance to see this truly excellent Canadian cast but I can’t in good faith tell you to spend hundreds of dollars on a theatre piece this structurally unsound. Dear Evan Hansen continues at the Royal Alexandra Theatre at least through May though I would expect it to be extended.